The best way to overcome your fear is to discuss your concerns with your dentist. Experiences as a child may become warped by time and reinforced by outdated media presentation of dental stereotypes. Things have changed, and our dentists are skilled professionals in dealing with patients who are nervous or worried about seeking treatment. Communication is the key. You must feel comfortable expressing your fears and concerns and have a sense that you are being listened to. There are many ways of making things more comfortable. The team at BSD pride ourselves in helping anxious patients to relax, and ensuring the visit as comfortable as can be. We have had great success in changing anxious patients to happy ones who enjoy coming back to see us. We take the time to apply a numb gel to your gum to take away the sting of the needle. Our dentists are very gentle and are very good at helping to take away anxiety during dental treatment. HAPPY GAS “Happy gas”, “laughing gas”, or, “nitrous oxide” are all describing the same form of sedation which can be used for patients who are apprehensive of treatment done with local anaesthesia. Not all dentists utilise these options, Gavin and Martin offer Happy Gas as part of their treatment and have good experience with its use. We can help reduce the anxiety many people feel with trips to the dentist or the thought of treatment. If you are anxious talk to our dentist or staff and they can help, if you have never tried ‘laughing gas’ or ‘happy air’ for dental treatment, maybe you should. 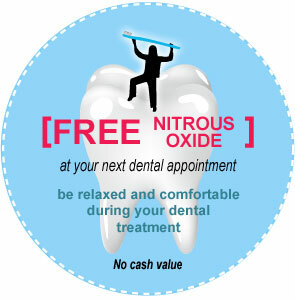 Mention this FREE NITROUS OFFER to realise the offer. Certain conditions apply; free offer not available for those people on medicare or government schemes, contact reception for details. Also available, if appropiate, is oral sedation. This is often a tablet taken an hour before certian proceedures which can be really helpful for certain people. Please contact us to see how we can help.